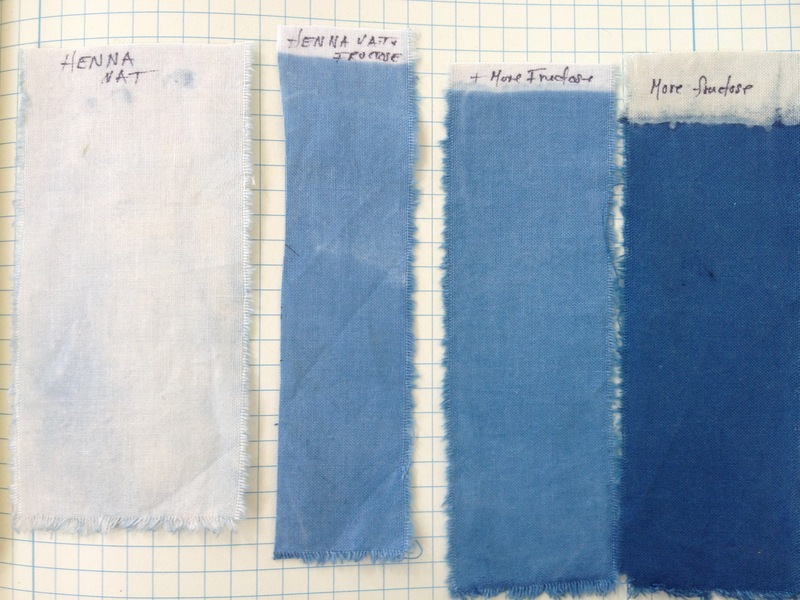 The questions I receive most frequently about natural dyeing seems to center on the indigo vat and its maintenance. 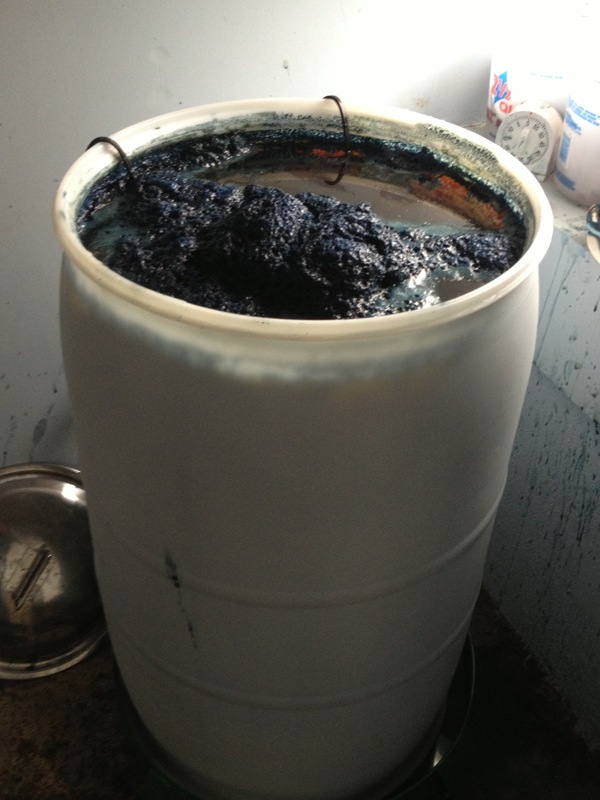 Since 2011 I have been making and using organic indigo vats, an art and skill that I learned from Michel Garcia. My current vat began in a 5 gallon vessel over 2 years ago. I enlarged it to fill an 8 gallon vessel, and then last year I enlarged my vat again to fill a 30 gallon container. The increased size was needed because I was dyeing larger pieces of cloth. The vat was made using henna as a reduction material. I chose to use this material because the slow release of sugars is good for a vat that will be maintained for a long time. I add fructose after each use and additional henna when I need to boost the reduction. Lime (calcium hydroxide) is the alkaline. The vat is used regularly and I achieve excellent color from the indigo. The large size challenges me to solve problems as I encounter them. It would be tempting to discard a small vat that was not behaving well and begin again, but emptying this vat would require a great amount of effort. As a result I’ve learned a lot about maintaining the indigo vat. An indigo vat is happiest when it is used on a daily basis. 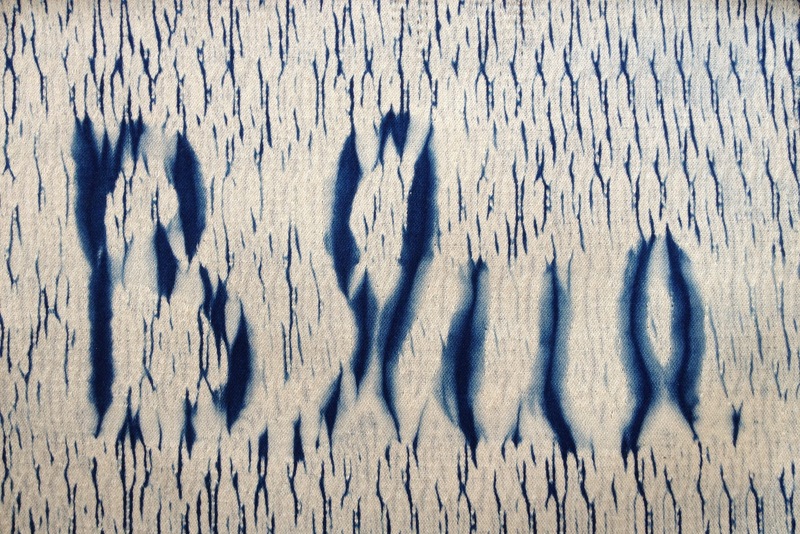 After each dyeing session I “feed” it with a bit of fructose, stir it to bring the un-reduced indigo and reduction materials up from the bottom, check the pH, and let it rest for a few hours before dyeing again. Occasionally I run into problems that I need to solve. Recently I was away from home for several weeks. Before I left, the vat was dyeing rich, deep blues. The color of the vat was a golden bronze and there was a good healthy “metallic” sheen on the surface and plenty of bubbles. When I returned home the first thing I did was add lime to the vat. When an indigo vat sits dormant for any amount of time it becomes more acidic and the pH goes down. I can test this with pH papers but a good visual indicator is to sprinkle some lime on top. If the lime is immediately “sucked” down into the vat – you can assume that the vat is in need of the lime. If the lime just sits on the surface, the pH is probably fine. Next, I stirred the vat and waited for it to settle. The color of the vat looked good, as well as the surface. The vat was a clear gold color and there was a coppery sheen on top. But the first test sample resulted in barely any color at all! That was a surprise, since I thought there was plenty of indigo in the vat. I thought I had also been “feeding” it with plenty of sugar. The vat had been used very heavily before I went away. I thought that possibly the indigo had finally been exhausted. 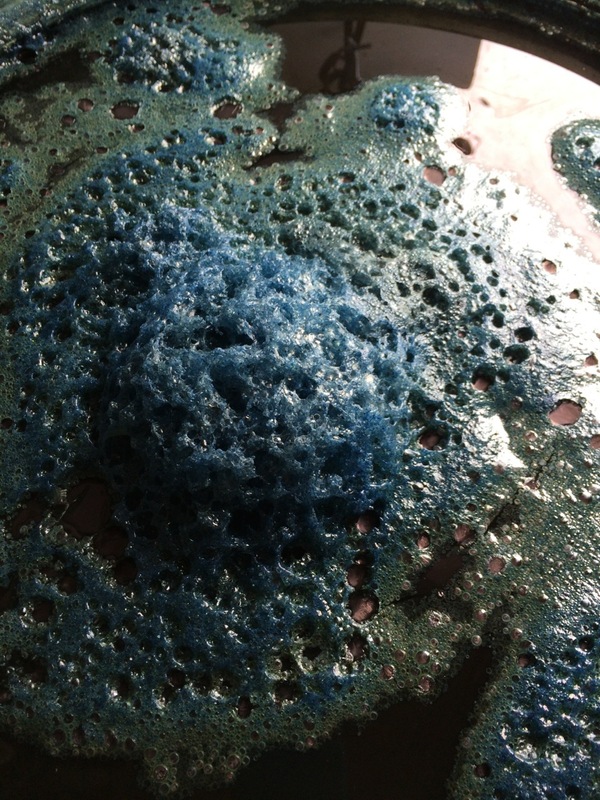 Before adding more indigo to the vat, I decided to add more sugar – a generous amount. Once added, the vat was stirred and I waited until the next day to do another test strip. It produced a blue, though it was relatively light. I repeated the sugar-stir-rest and dyed again the next day. It was darker. I repeated the sequence again, and finally got back to a shade of blue similar to that which I had before going away. The lesson here is that before adding indigo to a vat, test it thoroughly for pH and reduction. Although it “appeared” to be healthy, my vat was not reduced and the indigo wasn’t available to dye the fibers. Catherine my question is about the fructose vat. Can it continue by adding more indigo or is it better to start new? I suppose it depends on how much sludge is on the bottom. (I inherited a vat from one of your recent classes and it is dyeing nicely still. I have read the way to add more material is to make a mother solution with all 3 fructose, lime and indigo and then carefully add that to the vat. Do you agree? Thank you for all the good detailed info. Maureen, I’m glad to hear that the vat is working nicely for you. Yes, you can certainly add more indigo, along with the correct proportions of the other ingredients. The advantage of making a “mother” vat is that you can easily do it with hot water, which will begin the reduction quickly. Catherine I have a 10 gal week old henna vat that was performing beautifully. I was keeping it outside in the warm air. overnight we had a cold snap and the vats temp in the morning was less than 60 and no color on an 20 minute test strip. there is also little if any coppery sheen on the surface like there had been. 4 days later the vat is inside and I’m still getting very little to no color. ph is good. Each day I’ve scooped a pan full of solution, heat it to 120 add a little henna to it and return it carefully to the vat. I’ve made no progress. the vats temp indoors is 80 degrees. I started to wonder if it needed calx, so I added some to my heated pan solution, let it sit a couple of hours and did a 20 min test strip. it was no different than the main vats test strip, and the calx is not sucking into the vat as you describe. this was a strong vat with lots of indigo and has only been lightly used. Help!!! Cindy, Be patient with your vat. Since the vat is a new one, and there is plenty of indigo, you should be able to get it back into reduction. Give it a good stir every day, and a spoon or two of fructose. You should not need more lime at this point. The heat should help a lot. Patience….. stir every day….. Thank you so much for those encouraging thoughts. I’m so accustomed to hydro vats which I can fix in an hour or two. I also have been slowly feeding it cooked henna powder, and the fructose is new information. I ordered some yesterday after searching in town was fruitless. I very much enjoy the “tending” process. It’s a peaceful beginning of my day in the studio. Your book and blogs have been my major guide, thank you for teaching us all the nuances in indigo. Ps today the vat does have a little gleam of copper on the surface and though the test strip is still pale, yesterdays test strips have kept their color overnight. So there is progress! Catherine two tablespoons of fructose worked! the vat is dyeing very dark (darker than originally but it was only 5 days old when it quit). Thank you so much!!! what is the disadvantage of adding too much fructose? My vat is large because of the size of waxed cloth I am inserting, but the actual use is maybe 2 or three dips a day with less than a yard of fabric. I’m trying to get a sense of how often to add fructose and how much. 1 tbp at the end of the day? Your book recommends 3 tbs per 5 gal vat but for my limited use that seems like a lot.